From automated storage & retrieval systems to conveyors & sorters, modern distribution centers focus on throughput, equipment reliability, and uptime—just like any other production-oriented business. And just like other organizations, more distribution centers are turning to CMMS software for help. “In our environment, maintenance is all about keeping the company assets in like-new condition while minimizing the impact to our operation,” explained Randall, MPulse customer and facility manager for an international online retailer. Distribution center employees face more pressure than ever to get orders out the door, thanks in part to a surge in online sales over the past decade and high expectations for quick deliveries. Randall’s company has invested heavily in automated material handling systems to meet the growing demand—but more equipment also means more maintenance work for his team. Most distribution centers need CMMS software like MPulse to manage a wide range of equipment, from modern materials handling systems to more typical facility assets such as HVAC systems, dock doors, lighting, and plumbing. And like any maintenance manager, Randall needs to track costs—particularly labor costs—as well as set benchmarks and KPIs. Distribution center maintenance teams also have discovered the benefits of CMMS software coupled with Industrial Internet of Things (IIoT) technology. The combination enables maintenance teams to gather information directly from multiple devices, which can be almost anything with a sensor—including computers, vehicles, smartphones, appliances, building automation systems, and production equipment. 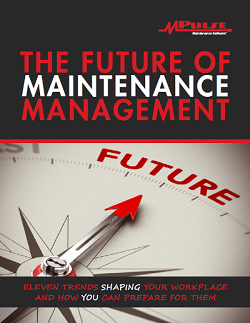 Maintenance teams can use that information to proactively perform maintenance and even predict asset failures—saving both time and money. The rapidly changing technology found in distribution centers means that maintenance software is no longer optional. Contact us to learn how MPulse can improve your maintenance team’s productivity and efficiency.